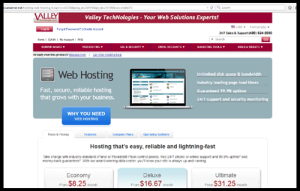 Hosting & Domains - Valley Technologies - Your Web Solutions Experts! Valley TechNologies web hosting servers are absolute state-of-the-art Linux servers, offering the best uptime ratings on the market! Hosting packages are available to fit every need and budget. And today, more than ever having secure hosting is an absolute must. Backing up your WordPress web site is essential to prevent potential loss of data in the event the site is compromised for any reason. Additionally, Valley TechNologies is also offering specific packages we have created to add additional security to your site. CLICK HERE to download the specs for our additional security packages. Then call us today at 262-673-1979 to help you set up the perfect plan for you with all the security features you need to keep your web site safe! Why is it important? Visit the link below.